These mixed triple packs of Young Elle Plain Bamboo Socks have got it all - colour, comfort and cute looks - for little girls who are just starting to care about their clothing choices. The soft, silky bamboo blend makes these socks feel nice against the skin, but also looks after that skin, with naturally gentle fibres that are also antibacterial and temperature regulating. 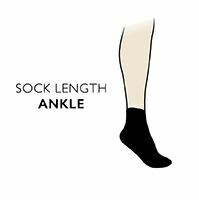 Young Elle Plain Bamboo Socks are ankle high, with gentle elastication at the tops and flat hand linked toes for smooth seams that help protect delicate feet from rubbing.